1 Carrying Nelson Home - After hearing John Roberts do a fantastic rendition at the Chicago Maritime Festival, I wrote to the author, Mike O'Connor, for the whole story and permission to record. Mike replied and said he "...once had to sail a Nicholson 45 off the outer quay at Gibraltar. Because there was a strong land breeze we had to back the jib to sail the bow off, get under way, and then swiftly tack to make the harbour entrance. It occurred to me that the sea breeze was like that every day - and it would have been like that in Nelson's time. The rest of the song describes an inshore passage up the coast of Portugal, across Biscay, and into the Channel." Brilliant! 2 Tow Rope Girls - English poet Cicely Fox Smith (C. Fox Smith) wrote some of the finest maritime poetry ever written and was said to put to sea in an age when women simply "didn't do that sort of thing." Tow Rope Girls tells the story of the girls who pull you back home; "...mothers, and sisters, sweethearts, and all!" On modern tall ships, the days of male only crews are, thankfully, over. Today, a third to three quarters of the crews are female. I've sailed with at least five female captains. William Pint first put the words to a traditional Quare Bungle Rye type melody and so many singers have picked up on this song that it has become a standard. 3 Emma, Emma - A great halyard shanty first recorded by A.L. Lloyd. After recording the song "Tommy's Gone to Hilo" with Mary and Chris I knew I wanted to do another song in which they sang in the chorus. For some reason I immediately thought of Emma, Emma, a song I had sung in the chorus of many times with many singers. They wanted guidance as to the feel of it, so we went to the van where I played an old Forebitter CD version of it, and they worked out the parts as we walked back into the studio. The Wisconsin verse was unavoidable. 4 In Fire Is Iron Born - When your significant other is a tall ship sailor, emergency medical technician, artist, and blacksmith, life is rich and conflicts are few. She invited me to a gathering of blacksmiths and other craftsmen in southeast Minnesota one October where I was able to get involved in making charcoal, hiking, exploring old limestone caves, playing music and sipping single malt on the site of a mill from the 1870's. I even got try my hand at the forge; an experience that was exciting as well as humbling. One barn contained a few forges, a power hammer, and a magnificent relief sculpture which read "In fire is iron born By fire it is tamed." As soon as we got home I snatched all Mariah's books on smithing and gleaned pieces that fell together very quickly. After completing the song, I realized I still didn't know where the quote had come from. A little noodling around the net yielded that the words were written by the Roman philosopher, general, and writer, Pliny, who wrote them about 2,000 years ago. 5 Cold Winds - This original ballad is a reflection of season's end written while crewing the schooner Charlotte Ann a couple decades ago. A 19th century Great Lakes sailor at the end of the season might find themselves aloft in a bosun's chair with a bucket of tar and a brush; exactly where I found myself in the latter part of the 20th century. I started out with the viceral image of your hands being so cold that you don't notice that you've injured them until they thaw out a bit. I had been playing around with some chords on my newly purchased concertina and later, while driving past O'Hare Airport outside Chicago, I suddenly pulled off the road and wrote down 95% of the song in a few minutes. Sometimes it just happens that way! 6 The Dead Horse Shanty - Sailors were paid an "advance" before setting out on a voyage from which they were expected to purchase all the things that they would need; from warm woolen clothes and oilskins to a good rigging knife and whatever they would need to pass the time. Of course, these funds were frequently scooped up by various landsharks who were only too eager to separate Jack from his advance for more immediate desires (See track 10). There came a time, on every voyage, when the crew had worked off their advance and an effigy of a horse was hoisted up and cut away overboard. As the horse faded away in the wake of the ship so did their debt. Singing, kicking, and "beating the dead horse" were all part of the ritual. I've seen it done from the deck of Mystic Seaport ships to concert halls in Poland, and aboard a square-rigger in the harbour of Workum, in the Netherlands. It's always lots of fun. The version I do is inspired by a band in Poland many years ago who played it with Stratocasters and Marshall amps. Rich joins me on the fiddle. 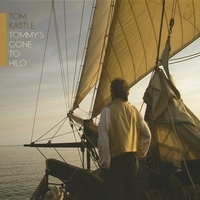 7 Tommy's Gone to Hilo - A shanty, here more as a ballad, named after the port of Hilo. pronounced "High-low." in southern Peru, not Hawaii. I still need to get to Peru and check it out sometime. I have always loved the slightly meloncholy, slightly liberating feel of the melody and words. We were thinking of which (if any) instruments to use as we had Chris and Mary's van packed to overflowing with the various instruments they play. I thought putting the twelve-string guitar in felt "right" and had started to rehearse it that way for a couple weeks. When he heard the song, Chris originally suggested an Appalachian dulcimer but, during a moment of inspiration, ran out to his van and returned with a rather large accordion which he played with relish. 8 The Bigler - Tongue in cheek tale of a fast passage aboard the legendary 19th century Great Lakes scow of the same name. This vessel was capable of overtaking most any ship, if that ship would "hove to and wait". This version is built upon the one collected by professor Ivan Henry Walton in the 1930s and 40s as he trudged around the Lakes with a record cutting machine taking copious notes and documenting some fantastic maritime traditions now housed at the University of Michigan in Ann Arbor. 9 Dancin' Jimmy Owen - Based on the wreck of the Henry B. Smith during the Great Storm of 1913 on the Great Lakes. The most colorful words are directly from the first mate, who had the great fortune to contract pneumonia and leave the ship early to go home to Cleveland, hence, becoming the sole survivor. Newpaper acocounts and interviews courtesy of a former director of the Marquette Maritime Museum. 10 The Jolly Roving Tar - Collected by Anne and Frank Warner (though others tell of an earlier version as well) and sung by countless maritime singers, this one tells of an age old phenomenon still experienced today by sailors with cash in their pockets, in ports throughout the world. When you get paid there is an almost overwhelming feeling to go ashore and spend "like a sailor"; and the welcome is warm. The money and the welcome in times past seem to run out at approximately the same time. Modern tall ship events seem to extend the hospitality a few more days. 11 High Barbary - Like a Michael Curtiz pirate film in six verses, this one's roots go back to the 1500s. This version was recorded at Chris and Mary's "Mad Toast Live!" show at the Brink Lounge in Madison. In spite of never hearing it before they dove right in for a truly fine performance which led to the obvious decision to ask them up to the studio. 12 Cappy John's Bride - A fine tale and examination of sea going terms and romance from Fred Gosbee. I learned this tune from Matt "Gershwin" Goacher, friend, shipmate, relief captain, and singing companion aboard the square topsail sloop Friends Good Will during the "Golden Summer" of 2007. Thanks to the musicians, sailors, and shipmates; to Dave, Mariah, and Jose the Cardinal). Special thanks to Codrut Birsan. For the crew of the "Golden Summer" and for those over the bar; Capt. Jerry, Ed Pratt, Mizzen Don, and John Schaul.